The weather forecast for today was way off. We expected a sunny day in the 50s and got overcast skies in the low 40s. A couple of my friends got to the lake before me and said the fog lifted enough to get out safely. 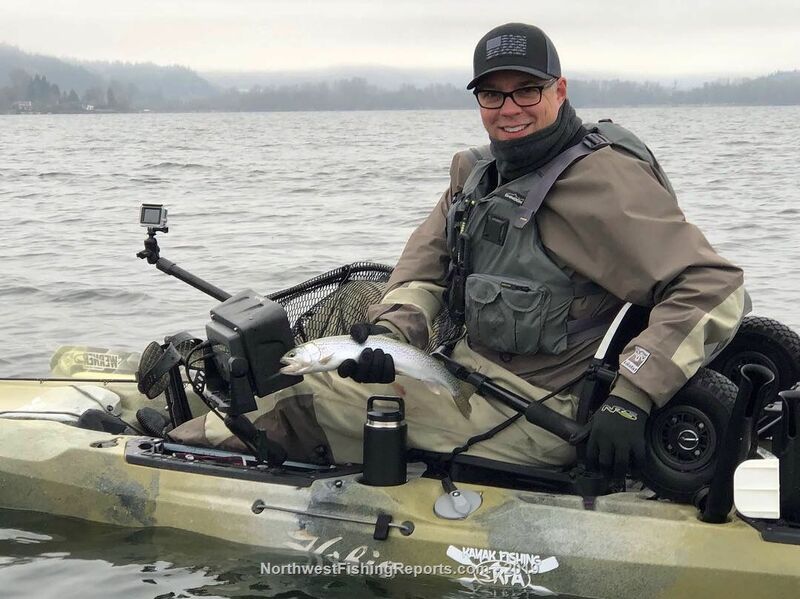 Kayaks are vulnerable when visibility is low. I got to the launch around 11 AM, rigged up my Hobie Outback, and headed due north. My friends were already out by the weather buoy so it would take me a while to catch up. I started trolling a 13g Tasmanian Devil Lure in the Bleeding Frog pattern behind four colors of 18-pound lead-core line and 50 feet of 12-pound fluorocarbon leader. I got three-quarters of the way to the buoy when the first fish hit. 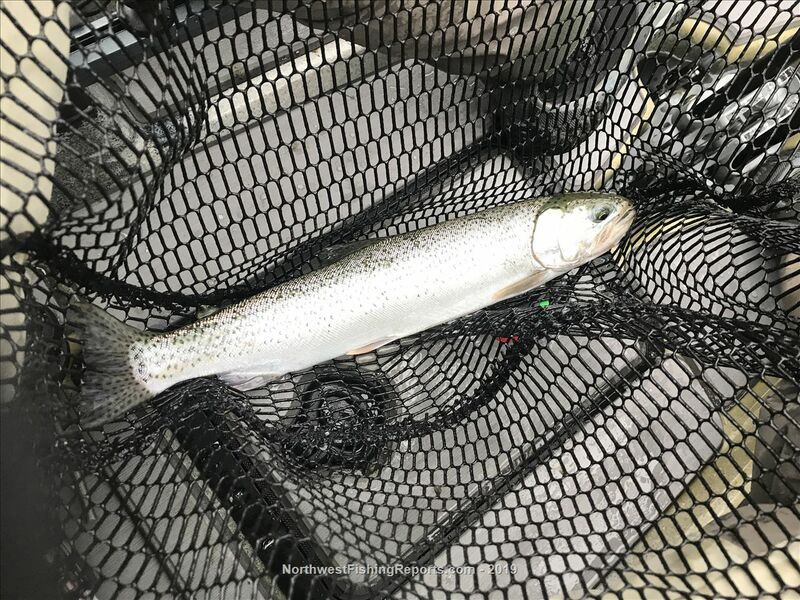 It was a nice 15” cutthroat trout that I released safely. I didn’t have my line in the water more than a couple of minutes before a smaller one hit. The fishing turned off for a bit after that. My friends and I caught up around the buoy and worked the area. They had already gotten three cutthroats between them. I changed up the Tassie Devil to the Christmas Tree pattern, and the action immediately picked up for me. I landed a nice 17” cutthroat followed by another one that was 17.5” long. The cold temps really wore us out. We started making our way toward the boat launch earlier than usual. I picked up one more trout as we passed near the Issaquah Creek. That gave me five cutthroat trout for the day and eight total for our group. Not bad for just a few hours of fishing. There weren’t a lot of boats on the water today. We talked to a few, and they told us the action was slow. We got back to the launch around 2:30 PM. It was great to see a WDFW police officer checking fishing licenses and catch limits on all the returning boats. He was friendly, and we had good chat about the kayaks. 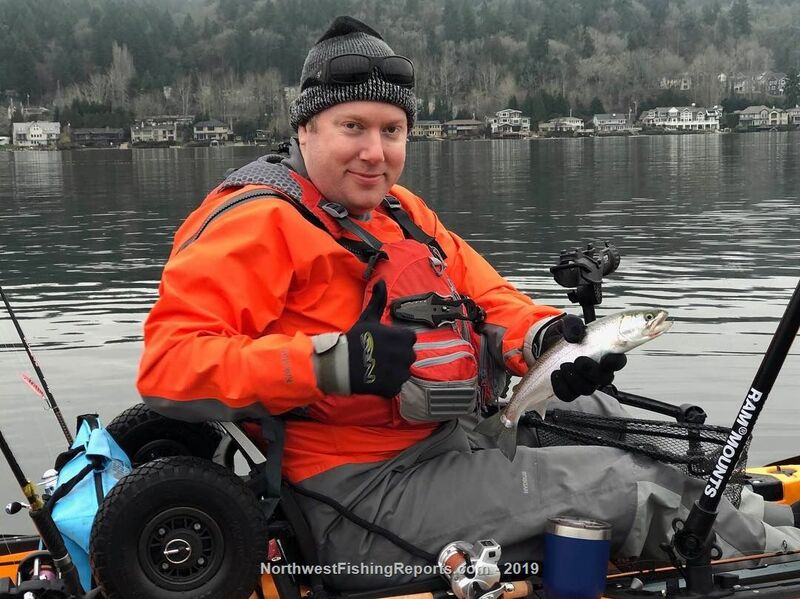 Lake Sammamish is an amazing fishery, and I hope it stays that way for a long time. 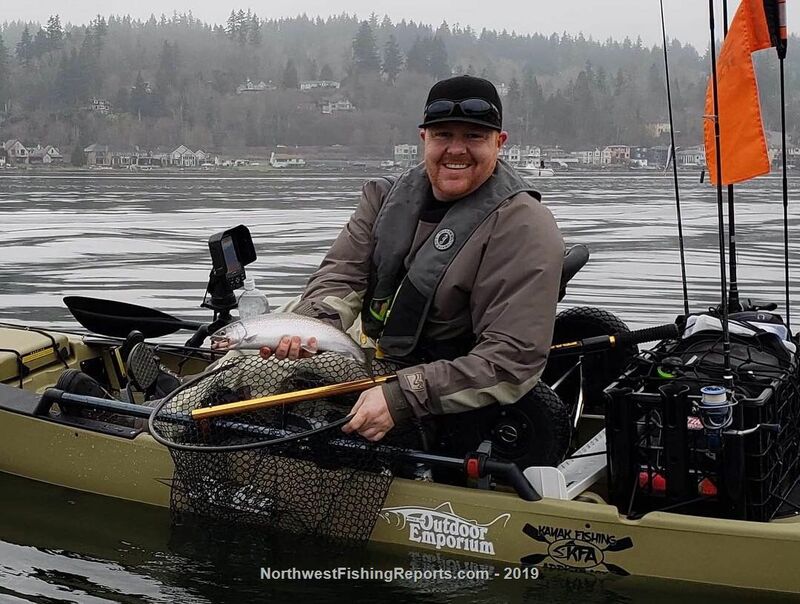 "Lake Sammamish is an amazing fishery and I hope it stays that way for a long time". I say "AMEN" to that brother. 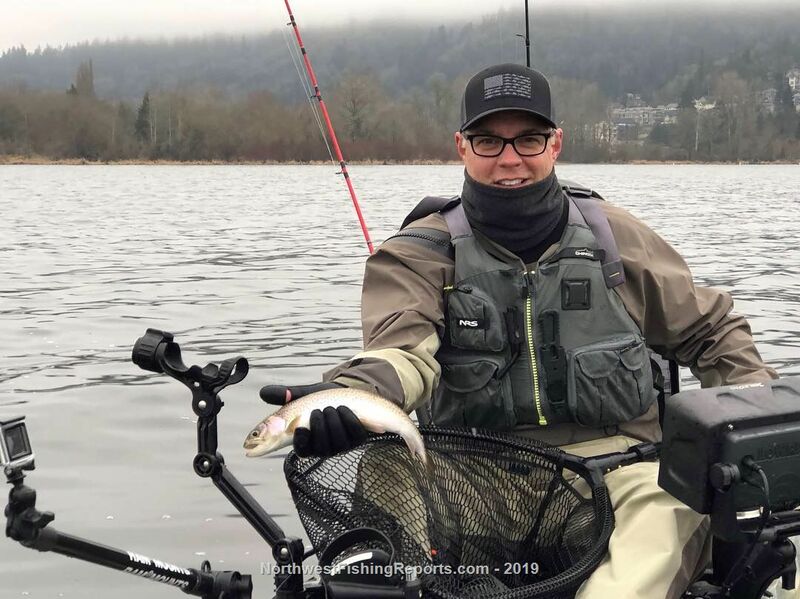 Given the Cutthroat fishery survives year to year on Lake Sammamish from native natural reproduction and not from hatchery plants, It will only stay that way if we all try to treat this fishery with tender loving care which means employing "catch and release" to the best degree possible for each fisherman. Enjoyed seeing your nice photos. Thanks Sharphooks. I safely released all of mine. Nice Chris......I spend most of my time trying different setups. Some strikes but no hook ups. Are group of 3 all got one each all on Tazzi’s, two were the 7 gram versions. Not sure about how much color means to these fish when compared to a proper depth. I tried from 2 colors (early in the morn) to over 4. The two Lead Core set ups got their fish at 3 colors and so were my other strikes. I personally do not run that long of a leader, maybe I should! I am about 20’ of Mono and 4’ of Flourocarbon. How do you Rig your Tazzi? Siwash or Octopus? Is it tipped with anything? I saw your two buddies but missed you. Thanks for the nice report! Sorry I missed you, Bob. I got all five of mine on Sunday with 4 or 5 colors of lead core. The longer leader length has always worked well for me. Check out the Seaguar Steelhead/Trout leader. I only use the 13g Tassie Devil. I replace the treble hook that comes with it for a #4 Gamakatsu siwash hook since I'm strictly catching and releasing the fish. I did something different this time and added a split ring between the bead and hook. That added a little more action and set the hook farther back from the winged lure. Try it out and let me know if that helps your catch rate. Thanks, Roosterpie. I saw your report too. I've had plenty of tough days on Lake Sammamish. My persistence has paid off with a lot of learning. Speed and depth play a big role. I'm still trying to figure out how to choose the right tackle based on conditions and season. A kayak has some advantages like low speed trolling and feeling the strike. We can change course quickly and double back when fish are in the area. We can't cover as much water and deep fish are harder to get. Lugging around a heavy downrigger ball is no fun, although some do it.